The best rat cage will make both you and your pets happy. It will give your rat enough room to explore and be stimulated while being simple to clean and maintain. To help you find the right cage for you and your furry friends, we researched a range of styles and brands to find the very best. Before we get into our product reviews, let’s take a look at some of the things you should know about before you shop. Materials: Most of these are made of plastic but there are a few wire cages that are made of steel. 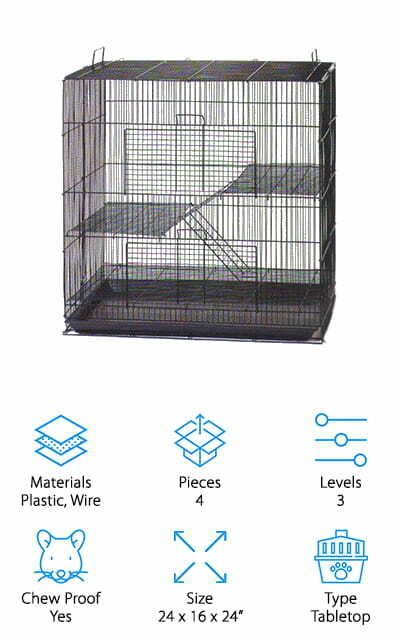 Steel is more durable but some of the plastic wire cages have been treated for extra strength and durability. Pieces: This includes the top and bottom of the cage as well as any ramps, levels, or accessories. A few of our choices come with some nice extras, like feeding bowls, water bottles, or exercise wheels. Levels: Levels refers to how many different horizontal surfaces there are in the cage. Sometimes this is just a small balcony, other times it’s a whole floor. We counted the bottom level or base in this figure, too. Chew Proof: While a handful of these products are chew proof, some aren’t. 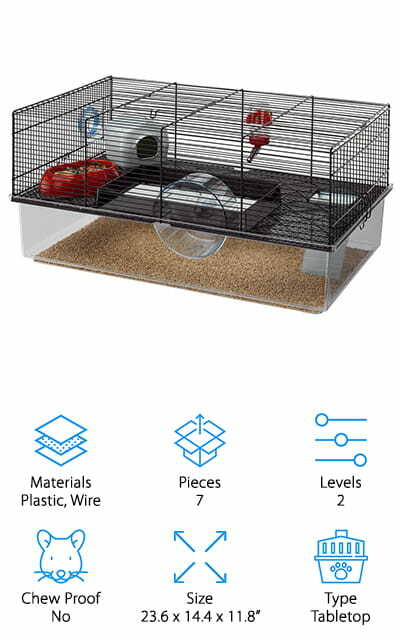 That’s not to say that your rat will be able to immediately escape, just that you need to monitor the state of the cage. Size: These are the dimensions of the cage. You should have some idea of where you’re going to place your cage before you buy it and the dimensions will help you see what will fit and what won’t. Type: There are 2 main types of cages. Stands can sit directly on the floor while tabletop cages need to sit on top of something. We also included a travel cage because we think that’s important to consider, too. Now that you know a little bit more about what to look for, let’s move on to our rat cage buying guide. Whether you’re looking for a place for rat babies or a rat starter cage, you’ll find a lot of great options here. Our top and budget picks are up first. That’s the best place to start to get an idea of the range that’s available but stick around, we found a lot of unique options. Alright, ready? Let’s get to it. Our top pick is a metal rat cage called the Midwest Critter Nation. Pet owners will love the full-width double doors. It’s really easy to get in the cage so feeding and cleaning are much easier. The wire spacing is perfect for rats to climb and explore. There are height adjustable shelves, too, so you can make different areas for your pet. They’re a wide, safe area for your pets to play while minimizing any risks of falls. Use the Happy Feet covered ramps to build connections between each level that won’t bother your pets’ little feet. It comes with 2 base pans so you can have a fresh one ready to go when it’s time to clean. Plus, attaching points allow you to attach additional accessories to the Critter Nation rat cage. Our budget pick also happens to be the best rat travel cage around. 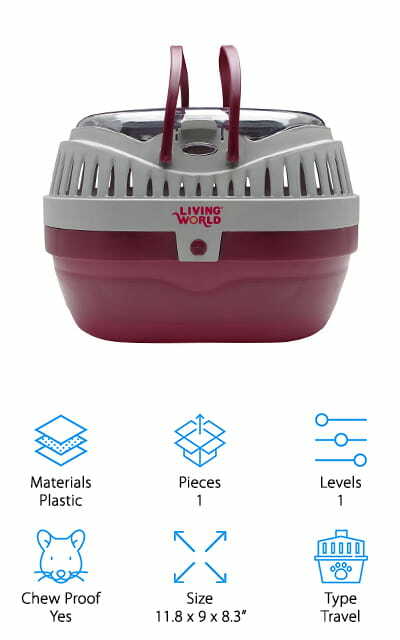 Hagen Living World Pet Carrier. One of the best things about it is it’s made of chew-resistant plastic and built to last. The dual handles are comfortable to hold on to and make it easy to carry and there’s a secure locking system to keep your rat friend safe and sound. As far as ventilation, don’t worry, there are tall vents all around the entire perimeter of the lid for optimal airflow to keep the environment comfortable for your pet. For easy access, there’s a large opening on the top of the lid so you can tend to your pet without having to open the cage. Plus, the non-slip floor gives you pet secure footing during travel. 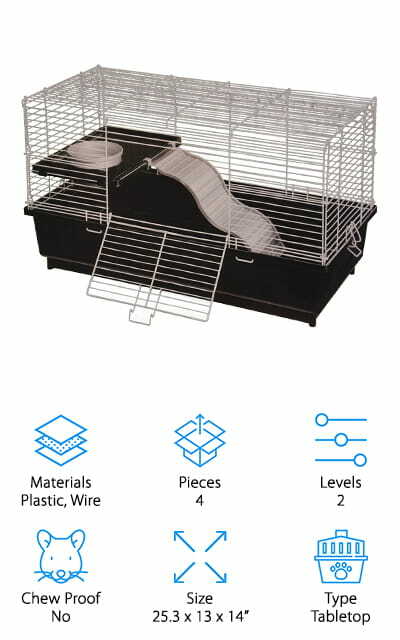 The Living World Deluxe Habitat is a combination of a wire rat cage with a plastic one. You get the best of both worlds, really. The wire top allows for maximum ventilation while the plastic bottom base is comfortable on your pets’ feet and easy to clean. There’s a balcony with an access ramp to give your rat some more room to explore. Plus, they’ll enjoy the tip-proof food dish that easily secures to the balcony floor. Your pet will love curling up in the hideaway nook under the balcony, too. 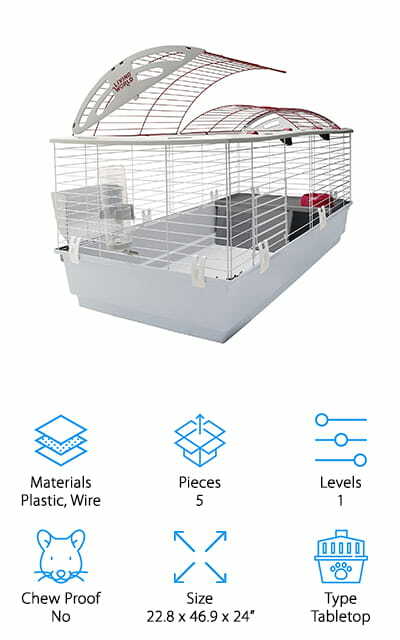 The wire top opens in 2 sections for easy access to the cage. That’s not all, it also includes a drip-proof water bottle and hay guard. They’re attached to the outside of the cage so they don’t take up any space in the cage. The Kaytee Multi-Level Habitat has a lot of great features that both you and your rat will love. For one thing, the base is deeper than comparable cages which helps prevent bedding and litter from spilling out of the cage. That not only keeps your pet a little more comfortable, it also helps keep the mess under control. There are 4 levels total with this habitat. The ramps that lead from one level to another and the level themselves are made out of solid plastic, which is a little kinder to your pets’ feet than wire flooring. They’re also much easier to clean. Another great thing about it is that the wire top locks into the base securely with chew proof latches. They’re really durable and will keep your pet safe in his cage. 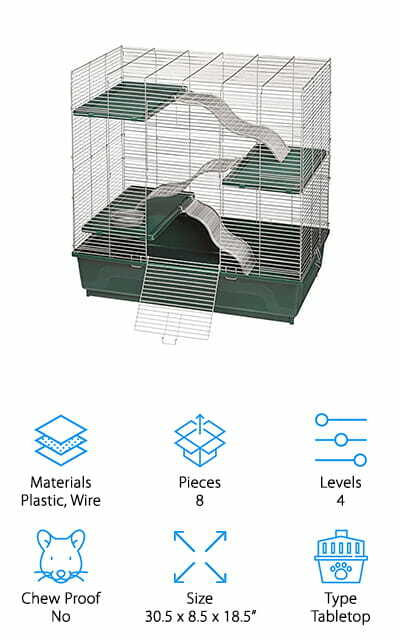 Another option for best cheap rat cage is the Prevue Pet Products Cage. 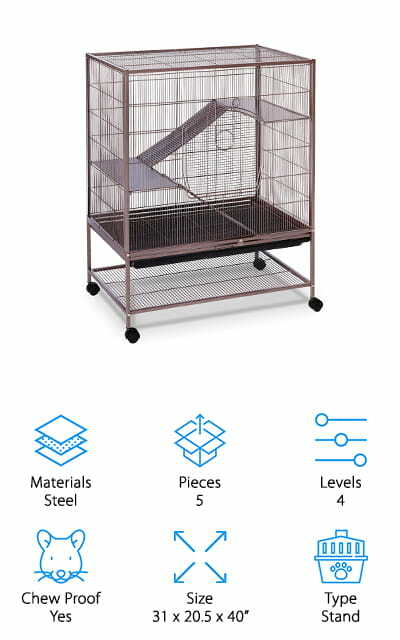 This is a decent sized tabletop cage that has 3 different layers for your rat to explore. It also includes an exercise wheel, 2 different platforms, 2 ladders, and a little house where you pet can go when he doesn’t want to be disturbed. This is a great way encourage your pet to climb and helps meet their natural need to be above ground. That’s not all, this cage has a rooftop door that gives you easy access to all 3 levels of the cage. Cleaning is simple, too, just remove the grille and pull out the bottom tray. Something pretty unique about this cage is that it’s available in 4 pastel colors: light blue, lilac, mint green, and yellow. 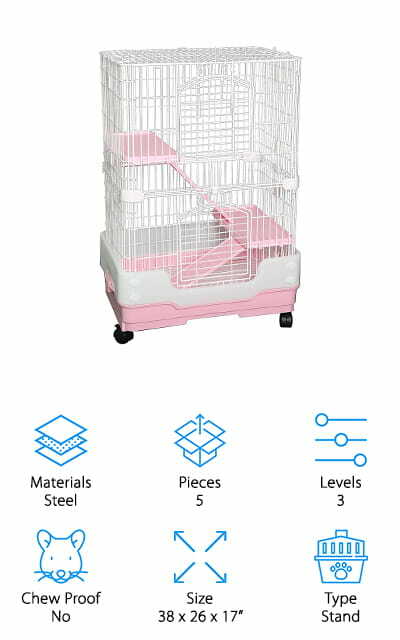 If you’re looking for a baby rat cage, the Ferplast Small Pet Cage is an excellent choice. This cage has 2 floors and is really unique in its design. The base/bottom level is made of clear plastic. It’s meant to hold the bedding material and allows your pets to tunnel, play, and dig. A ladder takes them up to the top floor where they can eat, sleep, and relax. It also includes a nest, feeding bowl, water bottle, and exercise wheel. You can access the cage through a small door on the top of the cage. It even has a security hook to prevent your rat from escaping. One of the coolest things about this system is its modular so you can buy pieces to add on to it if needed. The next rat habitat cage on our list is from Mcage. Because is pretty spacious, it’s the best cage for 2 rats. There are 3 levels in all. The wire spacing is ideal for small animals. It’s tight enough that it’s easy for your pets to walk and climb without being too tight that any little paws can get stuck. There are 2 front doors for easy access and a removable wire floor. Another convenient thing for pet owners is the bottom pan slides out for easy cleaning. The plastic wire is coated with animal safe epoxy to add some durability and keep your pets from chewing through. 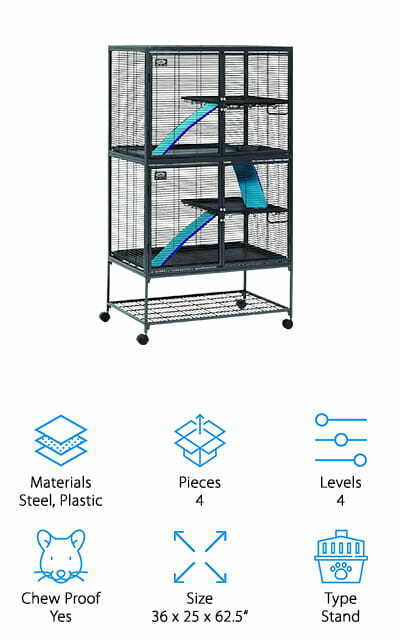 There’s a lot of room for toys and other accessories in this cage so you can make sure your rat has his favorite toys close at hand. The Kaytee My First Home Habitat is a nice little two story rat cage. This tabletop design has a deep base which helps prevent bedding and litter from spilling out onto the table and floor. That means deeper bedding for your pet and less mess for you. The wire top provides excellent ventilation and lets you keep a close eye on your pets. The ramp and shelf are made of solid plastic which gives your pet a nice surface to walk on and also makes it really simple for you to clean. The wire top securely locks right into the plastic base so your pets won’t be able to escape. Because the latches are made of chew proof wire, they’re really secure and will last a long time. Next up in our rat cage reviews is the Prevue Hendryx Rat Cage. It’s a sturdy, strong cage that’s meant to withstand years of use. The ramps and platforms are all made of chew proof, perfectly spaced solid metal. The large front gate is equipped with a wind-bell lock that gives you a lot of protection against escaping pets. There’s also a smaller door on the roof if you need to do some quick maintenance or care. As far as cleaning goes, it’s pretty simple. 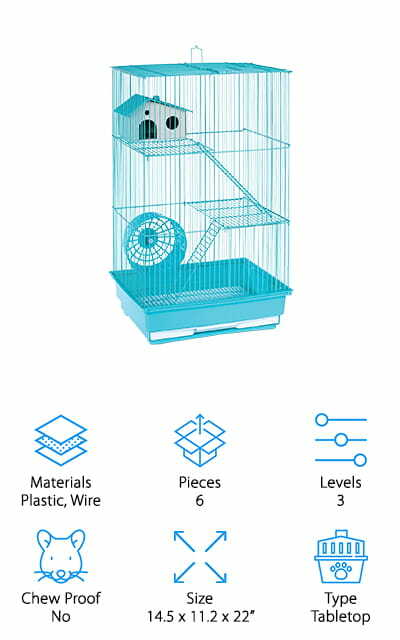 Just slide out the plastic tray, empty, and wash. There’s also a shelf on the very bottom, below the cage, where you can store extra food, treats, or supplies. The most unique thing about it is the finish. The dusted rose color and hammerstone finish give it an interesting look. Our last pick for best rat cage for sale is the Homey Pet Small Animal Crate. The white steel wire cage is spaced about ¾ inches apart, an ideal size for rats. It’s powder coated for extra durability and rust protection so this cage will last a really long time. One of the best features about it is the casters. The lockable wheels let you easily roll it anywhere. So, you can take it from room to room or just move it out of the way when you need to sweep underneath it. The pull out tray is easy to clean plus the plastic base keeps your pets out of the mess. It’s really easy to assemble and no tools are required. And get this: it’s available in pink, brown, and blue.